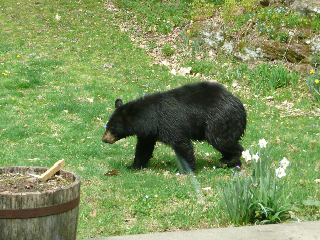 There have been numerous reports of bears in people's yard in Dummerston, Vermont over the past few weeks. Dummerston borders Brattleboro. The state police shot a bear in East Dummerston on May 3. To avoid attracting bears, take down your bird feeders, put the feed inside, have your grill and all other possible food sources and garbage under cover so bears can't get at it. On May 19 more than 100 people attended a meeting with bear expert Ben Kilham at the Dummerston School. The event was hosted by the Dummerston Conservation Commission and the Bonnyvale Environmental Education Center. Ben’s lecture was based on his firsthand experience raising cubs and observing black bears. It was illustrated with photos Ben took of bears. The lecture was followed by an extended question and answer period. Submitted by Anonymous on Fri, 05/08/2009 - 02:48. They should not have killed that bear. There should be more cooperation between law enforcement and the game warden. One would hope law enforcement would be trained on protocol since this won't be the last time a bear is encountered in Vermont! Submitted by Anonymous on Thu, 05/07/2009 - 08:23. According to my Web research, wildlife departments in Montana, Alaska and many other states trap and relocate bears who come near to human habitation. Only those that are visibly aggressive — which the Dum merston bear wasn’t — are euthanized. I like to think of Vermont as a progressive state and wonder can’t why we can’t follow this more humane and thoughtful approach here. I would like to know why Vermont Game Warden Price’s supervisor told Price to stay at home instead of taking the call about the bear in Dummerston on Sunday. Why do we taxpayers hire, train and pay game wardens if not to provide expertise in such situations?